At Wassledine we aim to make our living from our small farm whilst at the same time leaving it in better condition in terms of productivity, beauty and biodiversity than when we started. 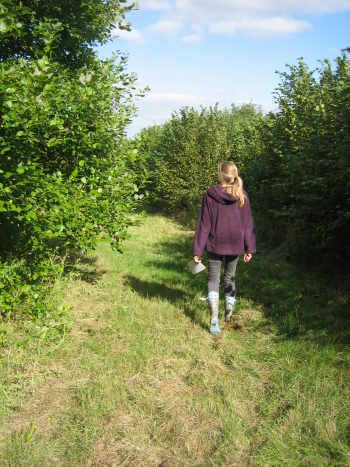 We look after around 70 acres of land in the middle of Bedfordshire; mostly grassland, with 10 acres of trees. Twenty or so acres is old meadows which hasn’t been ploughed for many years, or ever as far as we know. A small area was cultivated during the Second World War following pressure from the War Ag. Apparently they grew potatoes for one season after which the Men from the Ministry accepted what they’d been told the previous year – that the ground was far too wet. In a wet winter large areas remain underwater. Many years ago, before the Internal Drainage Board dug the bed out of the River Hit, that flows through the land, the fields must have been severely flooded most winters. This is beautiful lowland grassland, much enjoyed by local people who use the public footpaths that criss-cross the three fields. There are old pollard willows, most of which have unfortunately collapsed despite efforts to get them back into a cropping rotation. We got to them too late. These fields have been in a Department of Agriculture, Food & Rural Affairs (Defra) grant scheme called Countryside Stewardship since 1994, then latterly its successor, the Higher Level Stewardship Scheme. These schemes have made it possible for us to develop our Red Poll herd slowly, learning as we go. We’ve also been able to plant and lay hedges and improve fencing. We converted two other fields from arable to grassland and are managing them by grazing with cattle and cutting for hay. These fields were added to our Stewardship agreement in 2004. We created two new permissive paths here – making it possible to have a good walk around the land, for much of the year, without mixing it with the cattle – we know lots of people don’t like getting too close. We aren’t organic but we do use as few chemicals as possible – occasional herbicide to kill weeds in our willow and in amongst newly planted hedges, and minimal veterinary products when necessary. We hope that the new grass will, over time become as diverse as the old meadows alongside them. 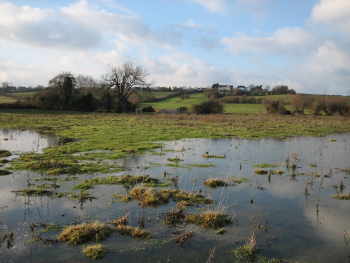 The winter wet is not great for intensive agriculture, but it is good for growing an interesting variety of plants and attracting invertebrates and birds. Here are species lists of birds and herbs if you’re interested. We enjoy the large range of plants and believe the variety helps to keep our cattle happy and healthy – it might even add to the great flavour of the beef they produce. Even when there’s loads of grass, cattle regularly browse the hedgerows. They love hops, spindle, elder, ivy, nettle tops and a huge range of other treats, and even go blackberrying in August and September! 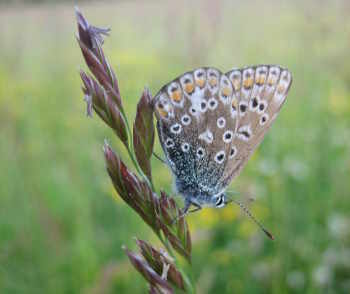 We have seen lots of common blue butterflies on the new grass during a couple of recent summers, attracted by the birds-foot trefoil, Lotus corniculatus, growing amongst it. Every so often in the summer, a few marbled white butterflies appear; a species that lives in sometimes small, isolated populations. Hopefully we are doing the right things to maintain ours, which usually hang out in the ride through our newly planted wood. We are lucky enough occasionally to put up a snipe from the wet meadows. This exciting, small wader with its erratic flight would have been more common along the river many years ago even though it was probably shot regularly. There are far fewer quiet, wet places for it to forage now and those that do remain are (like ours) probably too well populated with people and their dogs to be of much interest to a snipe out looking for accommodation. Each winter we see perhaps two or three woodcock in Bottoms’ Corner. Two decades ago, common buzzards were an incredibly rare site in Bedfordshire. We still associate these beautiful birds with the wilder parts of the UK; so it’s wonderful that we now regularly see two or three and sometimes more, soaring over Gravenhurst’s very tame fields and woods. 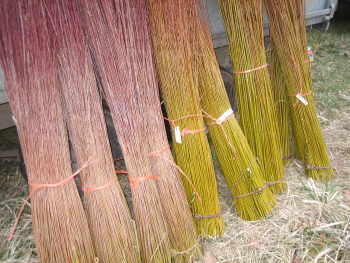 Being interested in and having some experience with growing trees, when looking for a diversification project, we landed, after extensive research, on planting willow. This has proved to be an interesting, very labour intensive yet rewarding side-line. We are now supplying basket makers as well as others who use willow – with material from the finest, most delicate varieties to real monsters. We are also selling products made ourselves – balls, plant supports, hurdles, etc. 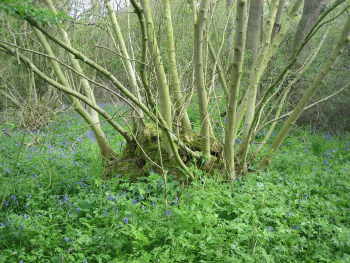 Chester Wood is a tiny remnant (about 1.5 acres) of semi-natural ancient woodland; a mixture of ash and hazel coppice stools, a few English oak and ash standards, some elm at one end, a couple of crab apples and a mix of shrubs including Midland hawthorn (Cratageous oxycantha). We think the soil is somewhat enriched from years of fertiliser spreading in the adjacent fields allowing an invasion of stinging nettles and thistles. Despite this, bluebells and dogs mercury persist as well as ransoms and a few wood anemones. 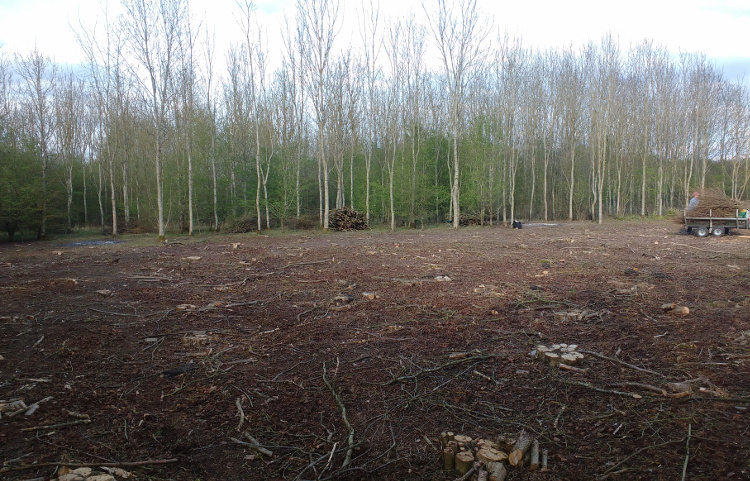 With a bit of grant aid from the Forestry Commission (which paid for a chainsaw amongst other things), we coppiced about 80% of the wood in three bites starting in February 1997. Although a bit alarming at first, the neglected ash stools responded really well. Some had not been cut for around 80 years although Jane’s Mum recalls her uncles cutting bits and pieces out, perhaps in the 1950s. Coppicing kept our own fire burning for 10 years and we also sold quite a substantial volume of firewood locally as well as keeping family members supplied, on and off. To fulfil grant obligations, the Forestry Commission required us to plant into gaps, which we did in around 2000/01, first using densely growing ash seedlings relocated, then a couple of years later with plants grown on from seed collected from trees in the wood. Some have died, but many are now thriving. After 10 years, the coppice regrowth reached over 18 feet. We now have a Forestry Commission approved woodland management plan in place for all our woodland and have just started coppicing in Chester Wood again (December 2017) – it’s very exciting. We are very fortunate to have retained ownership of an 8 acre corner of an arable field right next to Chester Wood. In early 1999, we planted Bottoms’ Corner (named after Jane’s Mum, née Bottoms, who played in Chester Wood as a girl). Again with help from the Forestry Commission, we planted this with hazel and a mix of broadleaf trees, leaving a wide strip alongside Chester Wood to regenerate naturally. It was always our intention to coppice the hazel on the basis that good quality hazel seems to be in demand. We started cutting hazel in 2003/04 and have cut a small cant each winter, selling tops as pea sticks. 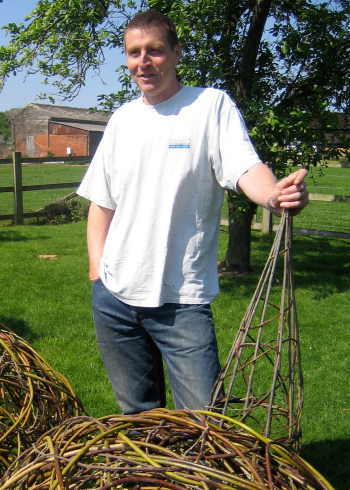 In winter 2007/08 we cut the first reasonably big stems which made hedge stakes and bean poles, and succeeded in selling a fair number. After cutting, stools are throwing up plenty of good looking, straight, branch-free poles. 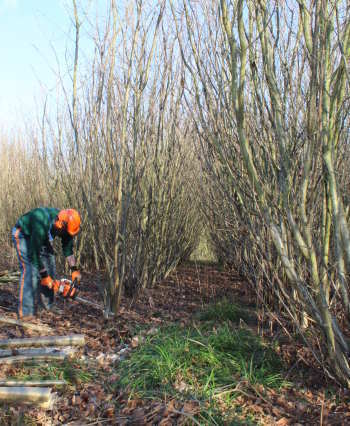 We now sell many thousands of hazel sticks each winter and spring, to hedge layers a variety of craftsmen and women as well as private and commercial gardens, including the RHS and Woburn Abbey. We’ve been watching the ground flora develop in a rather unscientific way. The arable weed cover (black grass, wild oats, thistles, etc.) that appeared in the first couple of years after planting has disappeared and the more open areas have developed a quite diverse cover of perennial grass and sedge species. Ash seedlings are in places very dense and we have been cutting sallow out for a few years because it is so successful and is competing with the hazel. The hazel is growing quite variably – in places it is very vigorous and in others less so; perhaps something to do with micro-variations in soil type? Where it is growing best, the canopy has closed, creating a beautiful, shaded, woodland feel with very sparse ground cover. Bramble and blackthorn are beginning to colonise some areas – great for biodiversity but no fun when cutting. 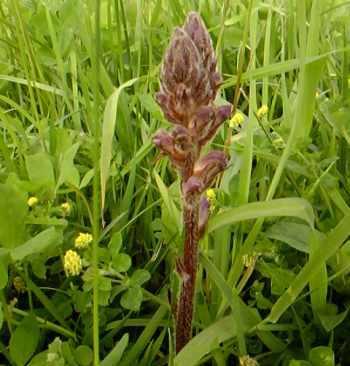 One exciting appearance since the spring of 2006 has been common spotted orchids which have popped up in several locations around the new plantation. 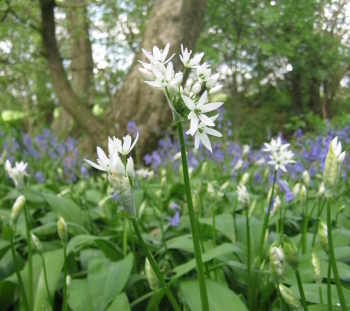 Whilst Chester Wood’s ground flora is a bit delicate, particularly in the spring months, what with the bluebells and primroses, Bottoms’ Corner, being a new plantation is far more robust so can manage quite happily having people charging about, making dens and playing games in it. We are now using Bottoms’ Corner for our spring and summer ‘Days in the woods’. 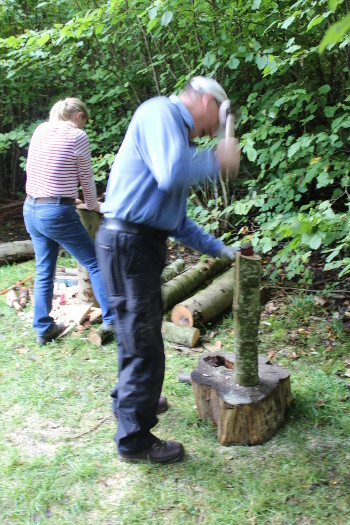 We offer a range of lovely experiences – basket making, hurdle making, willow obelisk plant support days, spoon carving, greenwood stool making and more, through the spring, summer and into the autumn. These are opportunities to learn and do something different but just as important, they offer a chance to tune out of modern life for a while and enjoy some serious relaxation in amongst the green. At some point since 1999, almost miraculously, Bottoms’ Corner has become a beautiful little wood and a wonderful place to spend time. Having a sandwich in Bottoms’ Corner one very sunny November day, we were delighted by leaves falling from an oak tree. Simple and beautiful. We started coppicing hazel in Centenary Wood in January 2016. Planted in 1989, this 14 hectare (33 acre) plantation was designed by the Beds County Council Forestry Dept (as was), to be managed for wood and timber production as well as being a great wildlife habitat and a lovely place for the residents of Greenfield, Flitton and Pulloxhill to walk in peace and quiet (apart from our chainsaw!) As the name suggests it was planted to mark the 100th anniversary of the creation of Bedfordshire County Council, but since that Council’s demise in 2009, it has been owned and managed by Central Beds Council. There’s information about the wood here. In May 2016, we put up temporary fencing around the first coupe, cut in January and February. This has prevented deer from eating the soft new growth this spring, although we had to add a run of steel mesh, rabbit net to it as the rabbits quickly learned that they could chew through the plastic mesh deer fence. The second plot was cut in January and February 2017 and is now fenced too. Both coupes are growing well. Several years ago a small hole appeared in one side. This attracted some attention and rubbish and one summer day it was set alight. This was quickly dealt with and thanks to the services of local tree guru (Ancient Tree Register/ Central Beds Council), David Alderman, a small oak cap was attached to a now largish hole. A bit of crown reduction, also thanks to David, began the on-going process of restoration. Unfortunately, the tree again burst into flames (we assume not spontaneously). A call that morning sent me down there to meet a fire crew from Shefford who, gamely armed with a stirrup pump, spent a long time dousing the flames through a now gaping opening in the poor old tree’s flank. After the brigade’s departure, another call sent me back down to see smoke pouring out of the tree again. A good friend, Chris, who was married there the previous year, so cares powerfully for the tree and was madder than a really mad bloke that someone could take the trouble to burn it, energetically hoisted buckets of water from the river and passed them to me, now inside. Armed with an enamel mug, I chucked water onto the smouldering underside of the massive root plate. And we succeeded in putting out the fire. David Alderman stepped in again with the offer of some well rotted wood chip with which we later filled the hollow tree. Amazingly it still looks mostly healthy. The hole is once again sealed with an even more splendid oak door, created by Ian Freemantle of EcoForestry. 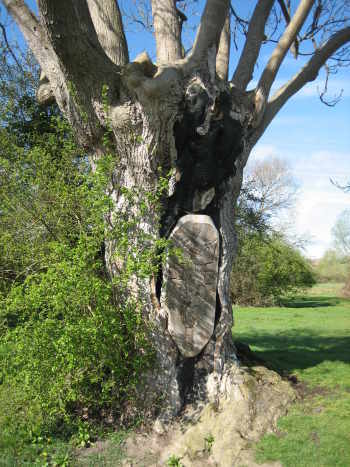 The picture (right) showing me and family was taken for an exhibition to promote the Ancient Tree Register. Thanks to David Alderman, David Stubbs and the Woodland Trust. A graduate with a degree in Environmental Science, Jane left college seeking a career in conservation. 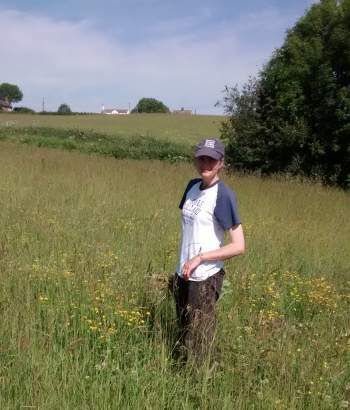 In employment with Beds County Council, the local Wildlife Trust then English Nature she found herself working with schools on community wildlife projects and then in environmental education. It was during this time she discovered storytelling and began to combine it with her freelance work. The granddaughter of a Bedfordshire farmer she was in the privileged position to inherit a small piece of Bedfordshire. As a result, with Guy’s enthusiasm and hard work, in 2003 the Wassledine business was born leading to the strange combination on a business card of storytelling, beef, willow and hazel. Alongside the business Jane remains in part time employment with the Wildlife Trust as a supply teacher at Paxton Pits Nature Reserve . 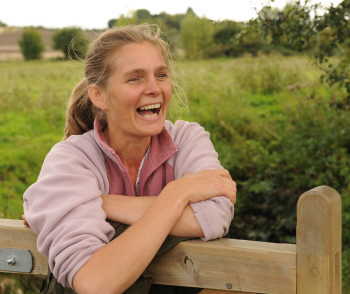 Jane has received training as a Forest school leader and continues her professional development whenever possible. Also a graduate, with a degree in Applied Biology, Guy thought his future lay in crop protection but took a job with Hertfordshire County Council’s Countryside Management Service in the late 1980s and has stayed in the countryside management line since. After four years in Hertfordshire as a Countryside Ranger, he moved to Bedfordshire County Council where he worked as a Project Officer and Rights of Way Officer (Where he also met Jane). In 2015 he completed 18 years working with the Forest of Marston Vale, one of the 12 Community Forests in England, looking after Community Liaison duties. He is now dedicated full time to the Wassledine Business developing his passion for hazel coppice, woodland and his growing collection of billhooks! ‘Wassledine’ is the name of one of our fields, which until 2003 had been arable but is now grass. We thought it would make a good prefix for the herd and a name for our business. Although we don’t know its origin, it has been suggested that there may be a Dutch link. It appears, spelled variously, on post and pre-enclosure maps so must be of some antiquity. There may be a link to wassailing and we like to imagine Jane’s forebears leading frenetic, alcohol fueled frolicking through the village and into the field (conveniently close to the pub) with a view to increasing their crop yields; well maybe.